Delaney loves words. She loves learning new vocabulary words & spelling just comes natural to her which is kind of nice, because I often have to ask how to spell something. 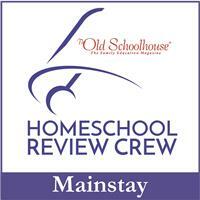 When products from Dynamic Literacy came up as a Crew review I knew she would want to use it. We received the WordBuild: Level 1 Set, (Includes WordBuild the Game). 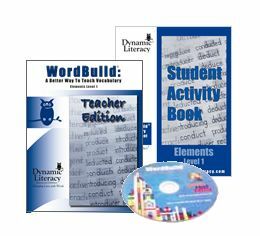 WordBuild: Level 1 Set includes WordBuild: A Better Way To Teach Vocabulary Element Level 1 Teacher Edition, the Student Activity Book, and WordBuild the Game. 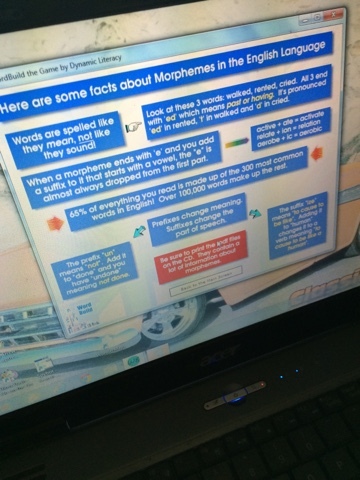 You also receive bonus content with a free account to the Dynamic Literacy website. 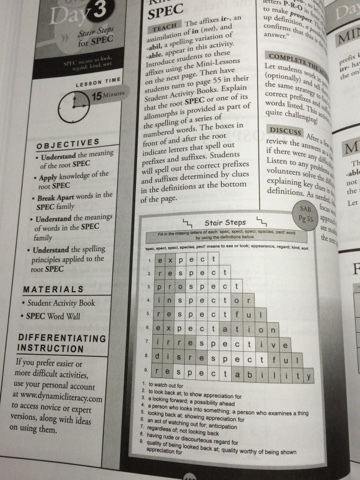 The $99.99 Elements Level 1 Set is recommended for 6th-10th grades or 7th-12th grade students who need remedial work. WordBuild teaches new vocabulary by learning meanings of Latin and Greek roots, prefixes, and suffixes in 28 units. There are 3 Levels available and the weekly units should last a year and only take 15 minutes a day. Each week is set up the same way. Day 1 uses a Root Squares activity to show how words are put together. 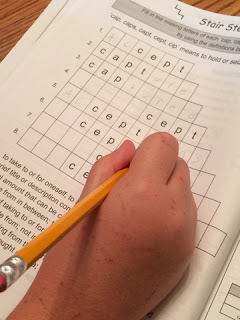 Day 2 has the Magic Squares activity to show how words are made up to match their definitions. On day 3 the Stair Steps activity reviews affixes and how word definitions match the pieces of the word. 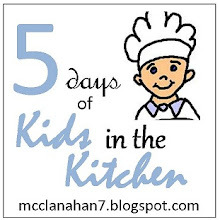 Day 4 the student uses the words in context, and day 5 is a check-up on each root. The Teacher Edition is a 336 page softcover book. 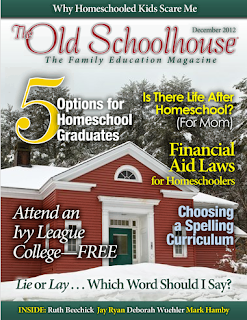 There is an overview of each root, word fun facts, step-by-step procedure to teach activities. There are weekly, semester and year end tests, and an answer key to student activity book. A prefix and suffix reference along with common words using those are included in the appendix. The 156 softcover Student Activity Book covers the 25 Latin & Greek root families. There are 4 activities for each root, practice activities, and root bingo game boards. Each week the activities are the same. WordBuild the Game is computer software that can be used on Window or Mac computer (computer requirements). 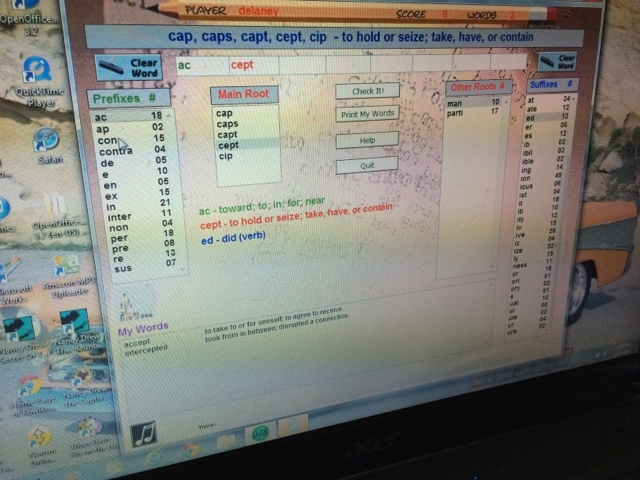 On this game you build words using Greek or Latin roots and adding prefixes and suffixes to them. Once you create a word the student can check the word & they are told they are correct or incorrect. This program uses I do, you do, we do approach by using morphemes. The teacher edition has so much information. The objectives are very clear to understand and the teaching segment can be read directly to the student or read by the teacher and retold to the student. There is a dialog that gives exact questions to ask the student and answers that they my have. Each root family is taught with prefixes and suffixes, using the vocabulary in context, and word fun facts.